This mural reexamines tools of sustenance and communication in a complex age of technology. A low-powered radio transmitter emits the Navajo phrase “Hozho naahaslii” on station 96.9. “Hozho” encompasses the intrinsic value of living beautifully. The title of the piece is a reference to the traditional origins of weaving in the Navajo Nation. Traditional stories and histories are not seen as myths but rather as timeless representations capable of continually providing perspective and guidance. The figure of Spider Woman is shown in a monumentalized format with patterns emanating from her fingertips, mirroring both textiles and circuit boards. The artist examines how traditional forms of knowledge and communication can coexist with technology in an age of excess. Nanibah “Nani” Chacon, is a Dine (Navajo) and Chicana artist. Nani is most noted for her female figurative works, which utilize bold colors and an illustrative format to create commentary on Native, Chicana and American cultures. Nani was born in Gallup, NM and grew up in both Chinli, AZ and Corrales, NM. Her clan is To dich iini (bitter water) and born of Chicano people. At 16 she was introduced to graffiti and began a career as a graffiti writer and continued this practice for the next 10 years. 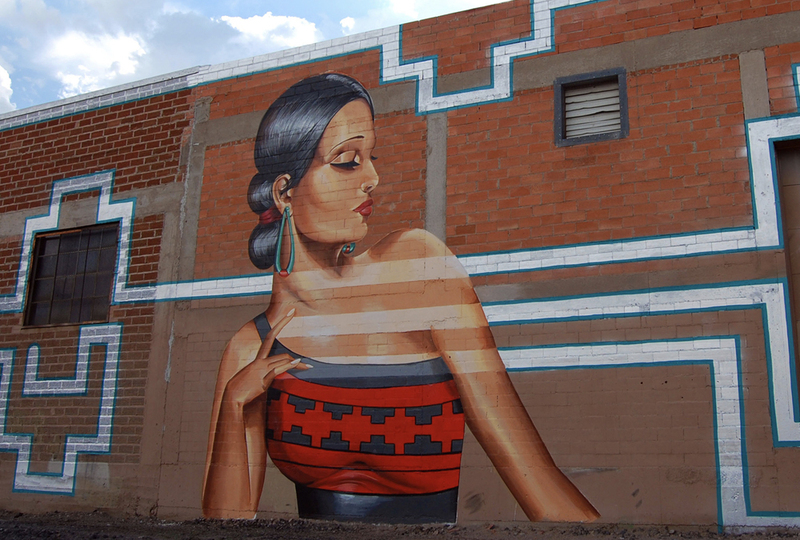 Nani continues to work in the field of large murals, with content addressing social, environmental and political justices that affect Native peoples. City of Albuquerque 1% for Public Art, The FUNd at Albuquerque Community Foundation, Intel Corporation, and Kwal Paint.